CrystalClear® Polish AC™ - Airmax® Inc.
Rinse carbon throughly before use. 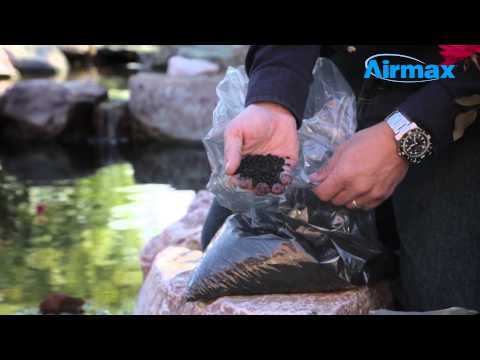 Remove bag provided from bucket and fill with the appropriate amount of carbon for your pond size or filter size. Then rinse the bag thoroughly to remove any carbon dust accumulation. Then apply to filtration unit. It is always best to use Polish AC™ in conjunction with a filter. It is not recommended to use Polish AC™ by itself within the pond. Replace bag with new Polish AC™ carbon every 3 months. It is important to maintain fresh activated carbon especially throughout the spring and summer season when pond pollutants are at their highest levels. For large fish loads it is advisable to double the amount of carbon for the pond size. Make sure to rinse Polish AC™ carbon thoroughly before placing in filter. Never wash carbon after it has been in the pond with tap water. If carbon is washed vigorously dunk the bag in water with no chlorine present. Polish AC™ carbon can be disposed of with normal waste service.